So what is RADAR? It's an acronym for RAdio Distance And Range, or something like that. It uses radio waves to "see" objects on the horizon essentially, but we're not going to go into that too much. What we're interested in is how to use the damn thing. When it comes to radars, you're either using one of a few ways to interpret the images on the screen. What the most basic radar will show you is a top view of the space around you within a certain radius. On it you will see little blips, or contacts, which represent objects around you. These areas will be lit up, usually green, and with a little luck, you'll be able to find their range and bearing. How you interpret the images is a little trickier, depending on how you do it. The old fashioned method was using a reflection plotter which was essentially a radar screen with a piece of glass over it that you could mark on with a grease pencil. See the page for Reflection Plotting for more details on how this works, but essentially you draw a whole bunch of lines and then come up with a fairly decent estimate of what you wanted to know. 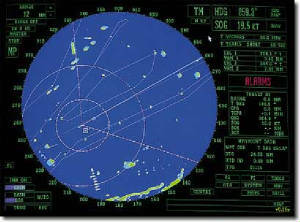 Nowadays though, a system called ARPA, or a automated radar plotting aid, does a lot of work for us. It will find ranges, bearings, cpa's, and all kinds of useful junk automatically. It works like a computer, you just use your little cursor, sometimes an actual touchscreen, and click on the info you want when you want it, no drawing triangles or anything. See the page on ARPA for more details on how to use this.